I grew up in Maine, moved to Texas when I was 12 and back to New England after graduating from college. Decided against going to medical school and instead ended up working in the mortgage field with my brother and have remained in the industry for 28 years. Met my wife Mary at a party and somehow convinced her to go out with me. We have been married 22 years this October. I was morbidly obese for most of my life, weighing over 300 pounds from my late 30s until I turned 47. Ironically, even though I hated any form of exercise, especially running, I set a goal of running the 2009 Boston Marathon, hoping to lose 50 pounds and raise $3000 for CF research in honor of my then 9 year old niece Julia. In 10 months, I lost 113 pounds, ran Boston nonstop and ended up raising $11,000 for CF. I realized that anything is possible and now use running as a tool to help others get themselves healthy. I also use marathons as a means to raise money to try and help Julia get healthy. 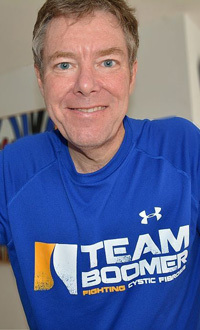 On April 21st, I will run the 2014 Boston Marathon – it will be my 34th full marathon in 5 years. For a number of reasons, my favorite marathon is the London Marathon that I ran in 2011. I loved the course, the people and that the charity component is such a huge part of the race. My tip for a new marathoner: If possible, run every part of the marathon course numerous times. When I ran my first marathon (2009 Boston) I knew every part of the course like the back of my hand which helped when I ran the full race.